Back in 2005, a bid to hold Turkey’s first ever “Armenian conference” had sparked nation-wide tensions. Then Justice Minister Cemil Cicek accused the organizers of “stabbing Turkey in the back,” while Sukru Elekdag, a lawmaker from the main opposition Republican People’s Party, branded the organizers as “traitors” in a speech in parliament. Yielding to heavy pressure, Istanbul’s Bogazici University backed down from hosting the conference, and the event had to move to the private Bilgi University. The detractors, however, did not stop there. Furious demonstrators bullied the participants as the conference opened, and the event could barely be completed. Since then, the atmosphere in Turkey has changed. First, there was quite a serious relaxation on the issue; Commemorations were being held on April 24 to remember the 1915 Armenian genocide. Scores of books were being published on the issue, which has also become a frequent topic in newspapers and TV programs. Even though the government maintains the official Turkish thesis on the 1915 events, the subject was no longer a taboo in the country. However, as a result of severe restrictions on freedom of expression recently in general in Turkey, we are sliding back on this scale back again. On the Turkish version of this website, I posted an article showing how article 301 of Turkish Penal Code, once used against slain Armenian-Turkish Journalist Hrant Dink, is coming back to the legal arena to silence the dissenting figures, including but not limited to Armenian descent MP, Garo Paylan, from pro-Kurdish HDP. Anyway, come back to our subject. Concerning having a debate on Armenian Genocide, one of the huge steps was a conference on Armenians Islamized during the genocide on Nov. 2-4 2014 in Istanbul. “No one called them by their real names again. They had to destroy and efface themselves to save their existence,” Rakel Dink, the widow of slain Turkish-Armenian journalist Hrant Dink, was saying in her opening speech at the conference, organized by the Hrant Dink Foundation. About 200,000 Armenians are estimated to have survived the massacres and deportations by becoming Muslims, according to the presentation of academic Ayse Gul Altinay. She expected that several million people in Turkey are today the children, grandchildren, nieces, nephews, and daughters- or sons-in-law of Islamized Armenians. “For 90 years, those people led an invisible existence outside the family and sometimes even within the family. They completely lost their Armenian names and their bonds with their families and the Armenian community. And even when they kept those names and bonds, they were unable to do so openly,” Altinay was back then said. According to the conference paper of historian Taner Akcam, the Islamization of Armenians was not religiously motivated as religious fanaticism was alien to the Committee for Union and Progress, the Ottoman party whose members perpetrated the genocide. Akcam described Islamization as an assimilation tool used in the genocide. “Assimilation was a truly systematic policy, and forced conversion to Islam was one of its essential elements,” he said. University of California scholars Arda and Doris Melkonian was also explaining how a large number of Armenian women survived the genocide by marrying Muslim men and were forced to convert. They noted that very few Armenian men had the chance to convert to escape death and that survival through marrying Muslim women was out of the question for men. I remembered this conference while I was reading journalist Vercihan Ziflioğlu’s magnificent book, titled “Story of Armenians of Purgatory,” which about Islamized Armenians who came out for the first time to explore their origins, to get back their cultural and ethnic heritage. What I understood from Ziflioğlu’s book that restoration and reopening of Armenian churches in Diyarbakir and Van hugely contributed to this process. 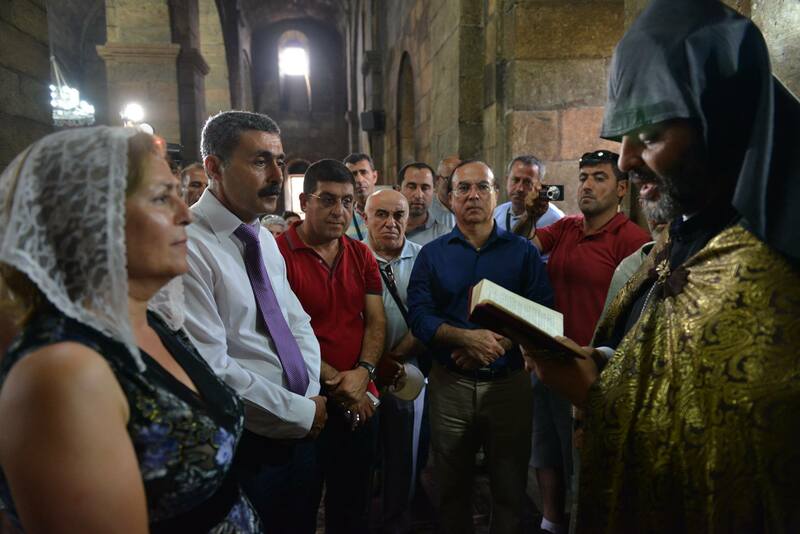 The church in Van was opened for religious ceremonies for only one day a year, whereas Diyarbakir church was open all the time (I do not know the recent situation after devastating armed conflicts between security forces and PKK militants in Sur region of Diyarbakir where this church is located). These churches triggered this coming out process. Because on the hand these re-openings showed these hidden Armenians that being an Armenian is not dangerous anymore and visits from other Armenians from abroad apparently lured them to these facilities. However, after this coming out process, most of these people found themselves in what Ziflioğlu calls “Purgatory”. Because after this revelation, they were not able to hide their identities as it was anymore and on the other hand there was not a warm welcome by Istanbul Armenians for these newcomers to Armenian identity. Armenian Patriarchate was reluctant to accept to baptize them. Then there was a long process, and some traveled to Armenia to get familiarized with Armenian culture; to be baptized and so on. And some Associations were established to show this identity exist, like “Armenians of Dersim,” “Armenians of Malatya” and others. It seems to me that these associations played a role in creating a short cut between Armenian Patriarchate and these no more hidden Armenians. When they issued a declaration showing that this person concerned has Armenian origins, the Patriarchate was not hesitant to baptize these hidden Armenians anymore. But I do not think this limited recognition has solved these people’s all problems. I believe, not only Armenian community but the State of Turkey should also recognize them. I am not talking about giving these people new identity cards in the paper. I am talking about recognizing their grievances; accepting that they are the victims of past atrocities in Turkey. Their very existence tells us a very tragic story about the Armenians once lived in east and southeast Anatolia. Why did these people change their religion? Why did they hide their identities? We all should ask these questions and listen to their answers not only with the mind but more than that with an open hearth! ← Did Selahattin Demirtaş, the Kurdish politician in prison, come out of the hat of a magıcıan?